A seer ( ), or prophet ( ), whose prophecies were directed against Jeroboam (II Chron. ix. 29). In the Masoretic text his name occurs as (ketib) and (ḳeri). He is quoted also (ib.) as an authority on the lives of Solomon, Rehoboam (ib. xii. 15), and Abijah (ib. xiii. 22); his work being entitled the "Midrash of the Prophet Iddo" (ib., Hebr.). Iddo, on account of his prophecies against Jeroboam, has been identified by Josephus ("Ant." viii. 8, § 5) and Jerome ("Quæstiones Hebraicæ," to II Chron. xii. 15) with the prophet who denounced the altar of Jeroboam and who was afterward killed by a lion (I Kings xiii.). 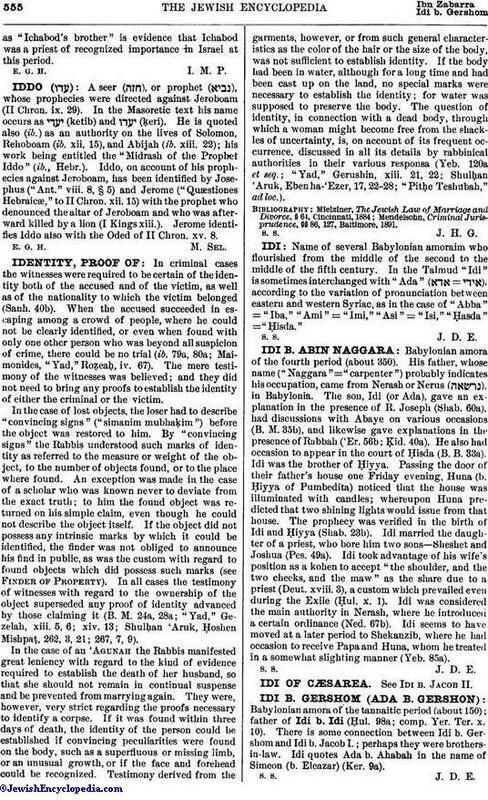 Jerome identifies Iddo also with the Oded of II Chron. xv. 8.